Superficial Radiation Therapy is the premier choice for physicians and patients when it comes skin cancer treatment options. With the SRT-100 Vision for Skin Cancer Treatment, physicians and patients alike, are privileged to witness the results through high frequency ultrasound imaging. 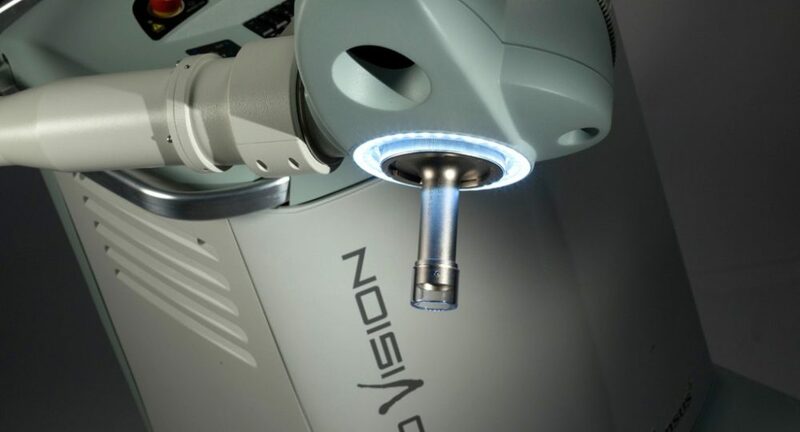 The SRT-100 Vision provides a laser positioning system for precise beam port positioning and re-positioning on the treatment area. LesionCam technology allows the physician and patient to view the progress of treatment by recording video of each session. This is beneficial to keep on file for patient records and treatment planning. The touch screen control console and control module allow the physician to facilitate the set-up, initiation, monitoring and termination of exposures. The SRT-100 Vision audio/visual monitor provides constant bi-directional patient communication during treatment. The compact size of the device makes it easy to service more patients than other machines. The Automatic AL and CU filter magazine applies the correct filter to match the necessary energy beam and depth. Dosimetry technology calculates proper dosing requirements and measures each dose administered to the patient during their treatment to ensure safety and optimal outcomes. Radcheck QC automatically confirms optimal system calibration each time the system is used to ensure the patient is receiving the correct dosage every time. For more information on how your practice can begin to use emerging technologies like the SRT-100 Vision for Skin Cancer Treatment, contact Sensus Healthcare today.